Fun and Creative ideas for Teaching English: Fomo, stress and sleeplessness: are smartphones bad for students? Fomo, stress and sleeplessness: are smartphones bad for students? Phones can have nasty side effects, but there are ways to minimise their impact on students. As with all technology, mobile phones can have their pros and cons,depending on how they are used. At their best, they can be useful tools for staying in touch, finding out new information and co-ordinating social activities. At worst, they can negatively affect concentration, communication and sleep, or increase fear of missing out, procrastination and stress. These potential negative consequences are especially important to consider for teenagers. Their brains work differently to those of adults: they are more susceptible to peer pressure and have less self-control. A study on the science of distraction found that each time an office worker was distracted (say from a text message or email), it took them up to an average of 25 minutes to refocus on the original task at hand. That’s what makes students doing their homework with their mobile phone nearby so problematic. It is a myth that most people can multitask. In truth, it takes up a lot of time, energy, effort and focus to switch between two tasks. Students don’t even have to be on their mobile phone for it to distract them. For tasks that require attention and cognitive demands (ie homework), researchers have found that the mere presence of a mobile phone may be sufficiently distracting to damage attention. In a fascinating study, researchers asked strangers to talk to each other for 10 minutes. Half the participants had the conversation with their mobile phones on the table; the other half had a notebook instead. The results? Those who chatted in sight of their mobile phone said they were less likely to be friends with their partner and reported feeling less close to them. What was particularly interesting was that the participants were not aware of the effect that having their mobile phone out had on them. Mobile phones can affect the quality of face-to-face communication even if you don’t consciously know it. The fear of missing out (Fomo) is very common in teenagers. It is characterised by the need to know what everyone is doing and worrying that they are having more fun than you. Mobile phones can be a dangerous vehicle for those with high Fomo. These students are more likely to experience lower overall quality in their mood, have increased anxiety, and are more likely to check their phones and social media during lessons or study time. Using your mobile phone too much in the evening can lead to going to bed later, getting less overall sleep, and lower quality sleep. Why does being on your mobile phone affect your sleep? The sleep hormone,melatonin, typically gets released at around 9pm at night. However, the bright backlight on a mobile phone can trick your brain into thinking it’s still day, suppressing the release of melatonin. This means being on your phone late at night still keeps your brain awake and alert at the exact time you want to be feeling relaxed and sleepy. Procrastination is extremely common in students. So much so that 75% of US college students consider themselves procrastinators. In our experience, if you were to ask a group of teenagers what they do when they are procrastinating, the common answers tend to involve their phone; texting, social media, games and shopping. Mobile phones might not turn students into procrastinators, but they can certainly act as a vehicle for their procrastination. Being over-reliant on a mobile phone can be bad for a person’s psychological health. Excessive use of mobile phones has been associated with anxiety, irritation, frustration and impatience. A study on young people and mobile phones found that 60% reported that they felt very agitated when they could not access their phone. Are students addicted to their phones? A recent study found that US students aged 19-24 spend around 95 minutes each day texting, 49 minutes emailing, and 39 minutes on Facebook. Young women are more likely to develop addictive mobile phone behaviours than young men. Those who are addicted to their phone (known as being nomophobic) report experiencing phantom vibrations, which is the phenomenon of checking your phone even when no messages have been received. Research by the Institute of Pyschiatry has found that adults who are distracted from work by emails and their mobile phone suffer a fall of 10 IQ points (more than twice the impact on IQ of smoking marijuana). Is banning phones the answer? 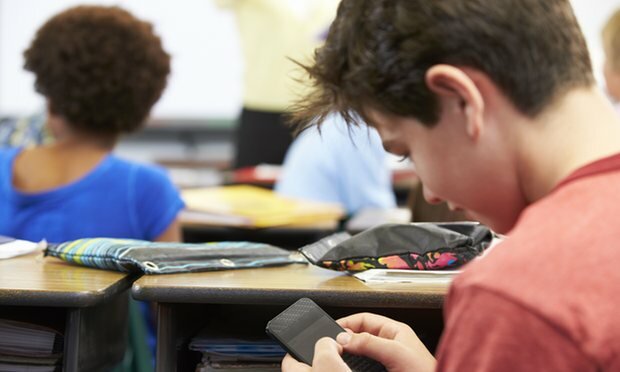 London School of Economics and Political Science recently produced a report that found that grades improved in schools that banned mobile phones. This effect was most pronounced for struggling students; however, trying to enforce this is a contentious issue for many students, parents and teachers. Get into the habit of managing your own mobile phone usage. It is very easy to get into the habit of checking your phone too much late at night. Simple tips on how to avoid this can be found here. Or at the very least, encourage students to put their phone on airplane mode. Self-control can be hard, so help students and parents manage their study environment at home. It is best not to be on your phone in the run-up to bedtime, but students can’t resist doing so, advise them to dim the backlight on their screens. No-one is as happy as they seem on Facebook or as wise as they appear on Twitter. Help students understand that people often project a false representation of themselves online. Encourage them not to spend too much time comparing themselves to others. Demonstrate that when a person tries to do two things at once there is often a drop in either accuracy or speed. This can lead on to a discussion about the kind of things that distract them while doing their homework.